While browsing a bookstore near his home in Seattle last year, Rob Flickenger came across a graphic novel titled The Five Fists of Science. The story portrays inventor Nikola Tesla as a crime fighter who battles his enemies with a pair of handheld Tesla coils—transformers that discharge spectacular streams of electricity into the air. To Flickenger, 37, the guns were beautiful, hilarious, and inspiring. “I started thinking, How would I do it?” he says. 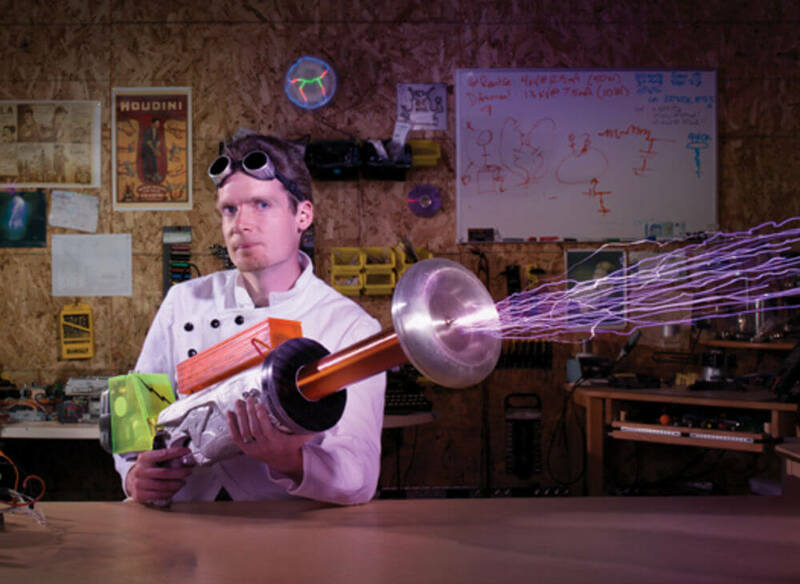 Flickenger wanted his homemade lightning machine to look as cool as the one in The Five Fists of Science, so he chose his model carefully: a huge motorized Nerf gun. With the help of Rusty Oliver at the HazardFactory, an industrial arts studio, he made an aluminum version of the plastic toy. He gathered cans, scrap metal, and even a bicycle fender and melted it all down. Then he and Oliver created a cast of the Nerf gun out of sand and clay and poured in the molten aluminum. After it hardened, Flickenger milled excess metal from the interior using a CNC machine and cleaned up the edges with a rotary tool. At the base of the gun is a 18v battery from a drill which is then boosted by an array of massive capacitors. Just pull the trigger to unleash a barrage of man-made lightning. Obviously, this is an extremely dangerous device for display purposes only and is not to be used as a weapon. To learn about tesla coils and perhaps even build your own, check out the complete project details. Flickenger, who designs wireless infrastructure for developing countries, had previously taught himself the physics of high-voltage electricity through free online courses from MIT, and he had experimented with Tesla coils in the past. But the smaller size of a handheld model posed new challenges. It also gave Flickenger one big advantage over Tesla, he says: “We have really cheap Chinese power tools.” An 18-volt lithium-ion drill battery would be more than enough to power the gun. The real hurdle was engineering the gun’s circuitry to safely generate high voltages. At one point, Flickenger wound conductive copper wire around a piece of acrylic tubing 1,100 times only to realize that the tubing was too fragile and would break apart easily. His early tests had mixed results. “I’d switch it on, and nothing would happen, so I’d switch it off. Then I’d switch it on again and set something on fire,” he says, half-joking. In fact, safety was a major priority—at first, he activated the gun via a remote switch only. Later, he added a toggle with an arm-the-missile-type plastic hood to prevent shooting the gun accidentally. Right now, the gun’s either on or off, but Flickenger plans to make it more like the cartoon version by adding a trigger. When he finally got the gun working safely, Flickenger showed it off at his wedding reception, held on a friend’s property. The guests were delighted. “There’s a corona discharge that comes off the front that’s just beautiful,” he says. “It’s almost like a fluid.” Although the gun’s not suited for fighting crime, it’s extremely popular at parties. To build his Tesla coil, Flickenger used a transformer from an old television and a battery from a lithium-ion-powered drill. A fan from an old computer server cools the spark gap. The current flows into what Flickenger calls the “hockey puck of doom”—an end cap of PVC pipe filled with silicone. Inside the gun, a transformer from an old television and additional circuitry repeatedly doubles the current and then pumps it to a capacitor bank. When the six capacitors hold 20,000 volts, the gun starts firing. All that electricity still blew a few pucks, so Flickenger recently tested a mixture of silicone and hexagonal boron nitride that draws away the heat, preserving electrical components. Once the electric current reaches 20,000 volts, it’s powerful enough to jump the gap between two tungsten wires inside the aluminum gun. Flickenger couldn’t find a housing strong enough to handle such a powerful spark, so he built his own out of heat-resistant porcelain. He also affixed a fan from an old computer server at one end to help cool the spark gap. After jumping the gap, the current runs into the primary coil, eight loops of high-voltage insulated wire at the gun’s nose. The coil induces a current in the secondary coil, a piece of plumbing pipe wrapped in copper wire. The current flooding the wire creates a magnetic field, which induces an electrical field inside the doughnut-shaped aluminum ring at the gun’s nose. This field generates streaks of blue lightning. For the most part, Flickenger operates the gun in his lab with the lights off. It can go for about 30 minutes before it needs to cool down. “When it’s running, it makes the whole room smell like a thunderstorm,” he says. The gun generates a lethal amount of current, so Flickenger typically sets it on his workbench instead of holding it himself. He grounds the device by clipping insulated high-voltage wire to the aluminum shell at one end, then to a nearby pipe or, if he’s outside, a metal stake planted in the soil. This ensures the current won’t run through the aluminum shell and into the inventor. “You don’t want to be the fuse in that circuit,” he says. WARNING: We review all our projects before publishing them, but ultimately safety is your responsibility. Always wear protective gear, take proper safety precautions, and follow all laws and regulations.